When you step into Kenneth Nealson's lab, it would be normal to look around for the bench where his research is done. But in this lab, there aren't any signs that assign benches to specific researchers. "Oh yes," Nealson says, throwing out his arms. "All this is mine." The AAAS fellow laughs a little when he says it, and it's a show of modesty, despite the vast space of benches and prep areas that make up his microbiology lab. His offices, lab and prep areas take up the entire top floor of the Stauffer Hall of Science, a five-story tower at the University of Southern California. In the two hours that Nealson has set aside to talk about his work, there is hardly enough time to cover the long-held assumptions about biology that his discoveries have defied. Those discoveries, which have revealed new creatures and the strange ways they live, are separate from the time he spent helping NASA determine how to detect life on other planets. Nealson says the key to getting a lab at the top of a tower at USC was to never get too comfortable to leave a job when it was time. "If you're not willing to move, then you couldn't have done what I've done," he says. And with each move, he pointed out, there was more money and a bigger lab. The story started with Nealson's Ph.D. work on quorum sensing at the University of Chicago in the 1970s. Quorum sensing is the mechanism by which bacteria communicate with each other. He studied marine bacteria that emit light in hopes of being seen and swallowed by fish. They thrive in the bellies of the fish, but if there aren't enough bacteria in the group to be seen, they turn off the lights to save energy. Since Nealson's discovery of quorum sensing, several decades of research has shown that different bacteria use the mechanism as a common strategy in bacterial wars, bacterial cooperation and interspecies interaction. After that discovery, Nealson moved on to the University of Wisconsin's Center for Great Lakes Studies. While there, he found the marine bacteria Shewanella in Lake Oneida, New York, in 1988. It's a poster child, he says, for a metabolic process called extracellular electron transport, which is also known as EET. The Shewanella has a membrane, but it can transport electrons from inside the membrane to the outside. The process occurs in other organisms as well. It can modify chemicals and produce electricity. While initial discoveries about EET were greeted with intense skepticism, the process is now viewed as a critical component of the geochemical cycling of metals, which is important for many processes, including the formation of soil and sediment. Like quorum sensing, the Shewanella could have occupied the remainder of Nealson's career. "That organism has become as famous as quorum sensing," he says. In fact, he was introduced at a conference in China recently as "the father of EET." But Nealson wanted to keep finding new things. So what better place to look than Mars? 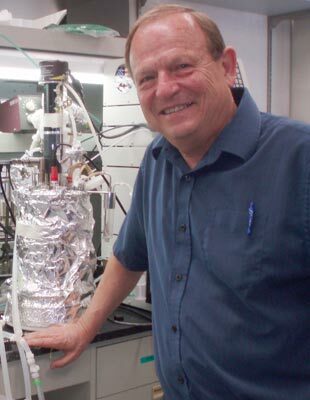 He left the University of Wisconsin in 1997 to work for the Jet Propulsion Laboratory at Caltech. There, with a 10-member team, he worked out the basis for a field dubbed "astrobiology." The team came up with some guidelines: Life needs a structure, or something that keeps the inside from the outside. It needs to harvest something from the environment. And you need to ask very simple questions of the structure, such as whether it contains the mixture of elements that exists in all life. The team planned to analyze samples from a mission to Mars, but the mission was canceled. So Nealson moved to USC. These days, his lab at USC is preoccupied with geobiology, which is defined on the university department's web page as "the study of the Earth and life on the planet over time." Nealson's team is studying some highly improbable creatures that inhabit ponds where life shouldn't be possible because of extremely high acidity. Nealson calls this work "the next big challenge," studying organisms in extreme environments where nothing should be living. In the current research, the team pulled organisms from pools in Northern California that have very high acidity. "Every time we get the data, we think we must have made a mistake," he says. But the data have come back the same every year for three years. They indicated a crossover between two kingdoms of life that should be separate -- bacteria and archaea. In current scientific understanding, an organism that carries a biomarker for bacteria in a specific isolated gene sequence will also have the genes of bacteria. But Nealson's team has found organisms in the pools that carry the biomarkers for bacteria but contain an inordinately high percentage of genes of archaea -- and vice-versa: organisms with biomarkers for archaea carry the genes of bacteria. These findings could challenge the current understanding of genetics and evolution. They present challenges for many reasons, starting with the fact that there shouldn't be this kind of genetic crossover between bacteria and archaea. After three years of revisions, Nealson expects the first paper on the organisms to be published soon. He talks about nearing the end of his career, but the new project has just received a three-year grant. "This is a great way to end my career," Nealson says, \because there's something really exciting going on here."